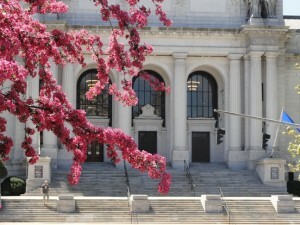 These indexes were compiled by Connecticut State Library staff to assist researchers and the public in locating hard to find state and federal government publications on a variety of topics. Please note that these indexes are not full-text and may be incomplete. For additional information please call Government Information and Reference Services at 860.757.6500. For more information visit the State Agency Profiles page for statutory authority, agency history, published history and articles, agency documents and list of commissioners. The Connecticut Health Bulletin is a series of monthly publications published by Connecticut's State Board of Health and later Connecticut's Health Department. The series begins in June 1887. The first issues included a Monthly Mortality table, a brief remarks page and meteorological table for New Haven. In January 1914 a new format began and included additional vital statistics and health information. The library stopped receiving the bulletin in 1990. Contains a collection of Public Health circular letters sent out between 1941 – 1984. A circular letter is typically a formal or official written document or communication that is addressed to a group of individuals. Current circular letters (2011-2018) may be found on the Department of Public Health website. Contains a collection of miscellaneous pamphlets published by individual bureaus within the CT Department of Health in the 1920s thru the 1960s. Each bureau or division had its own identification letter/numbering system. Bureau/Division names were also modified over the years. Publications produced by the Connecticut State Board of Education and the State Department of Education covering the years 1884 through the 1971-72 school year. Hospital Reports is a 112-volume set of official reports from psychiatric hospitals in the United States, Canada, England, Ireland, Northern Ireland, Scotland, Wales, and South Africa, covering a period from roughly 1830 to 1896. Forty-one U.S. states and five Canadian provinces are represented. The Works Progress Administration (WPA) was established in 1935 by executive order of President Franklin D. Roosevelt and funded by Congress through the Emergency Relief Appropriations Act of 1935. Headed by Harry L. Hopkins, the WPA offered work to millions of unemployed to construct public buildings and roads, operate arts and literacy projects and much more. In 1939 the Works Progress Administration became part of the new Federal Works Agency and its title was changed to Work Projects Administration. It was abolished on June 30, 1943. Works Progress Administration: [press release]. Below are links freely available of Works Progress Administration press release available online in HathiTrust. Please take note of our link disclaimer for any links outside of the CT State Library website. Please ask a librarian for assistance if the issue number you need is not listed as additional issues may be added to these resources in the future.